Home » Football » THE NEW YORK JETS ARE THE BEST TEAM IN FOOTBALL!!! THE NEW YORK JETS ARE THE BEST TEAM IN FOOTBALL!!! It is very RARE when I can find NO negatives from a Jets game, BUT that is the case tonight. In the first game of the Sammy Touchdowns era, the Jets played a COMPLETE game and DEMOLISHED the Detroit Lions. They scored THIRTY ONE points in the THIRD quarter and WON the game 48-17. This game was a COMBINATION of the Jets being SLIGHTLY good and the Lions being REALLY bad, so it might be an OVERREACTION but the Jets MIGHT just go to the Super Bowl. The Sammy Touchdowns era could NOT have started WORSE for the Jets as he threw a PICK SIX on his FIRST throw of his NFL career and Jets fans were in disarray, but instead of BREAKING, Sam Darnold BOUNCED BACK and led the Jets on a touchdown drive to TIE the game at 7. 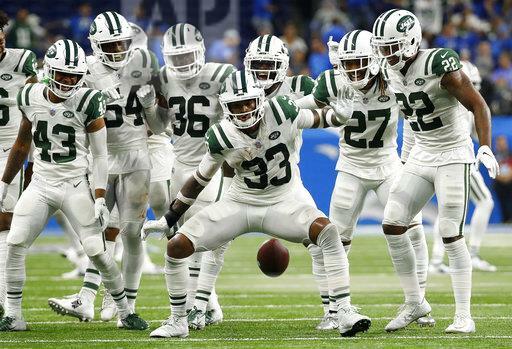 The Jets defense was DOMINANT throughout the game and they DISRUPTED Matt Stafford and the Lions offense THROUGHOUT the game and helped the Jets take a 17-10 lead into halftime thanks to FIRST career touchdown for Sammy Touchdowns, which was a BEAUTY to Robby Anderson. It was a GREAT recovery by Darnold from having the WORST possible start to his NFL career but he COMMANDED the offense and overall this game was a BIG positive for him. The Lions scored 10 UNANSWERED points to START the THIRD quarter to TIE the game at SEVENTEEN, but that is when the Jets came ALIVE and instead of me RECAPPING of the REMAINDER of the quarter, I am going to let the Jets speak for themselves. After all was SET and DONE, the Jets had a 48-17 lead at the END of the THIRD quarter and that was the FINAL score of the game. They move to 1-0 on the season for the FIRST since 2015. This was a COMPLETE game for the Jets. All THREE facets of the game showed up tonight in the motor city. The running game did a GREAT job in taking some of the EARLY pressure off Darnold, who FLOURISHED after that interception. The defense played GREAT and they played tonight with arguably ONE of their BEST players, Marcus Maye who was OUT for this game. One can only WONDER how good the Jets can be when they are FULLY loaded. I expected NOTHING from the Special teams but they showed up BIG TIME with the Punt return and Jason Myers was PERFECT on field goal attempts. Lachlan Edwards only had ONE punt all game but he PINNED the Lions and the Jets got some points as a result. This was a BIG win for the Jets, who now play the Miami Dolphins for their home opener in New Jersey next Sunday. The Jets are the DARLING team of OVERREACTIONS from Week ONE of the season, we will see if they can SUSTAIN this performance next week.